LinkedIn is one of the most effective B2B marketing tools available today. It allows you to target by company, job title and similar demographics. LinkedIn Ads, the native advertising platform for LinkedIn is now just as powerful as Twitter or Facebook Ads. 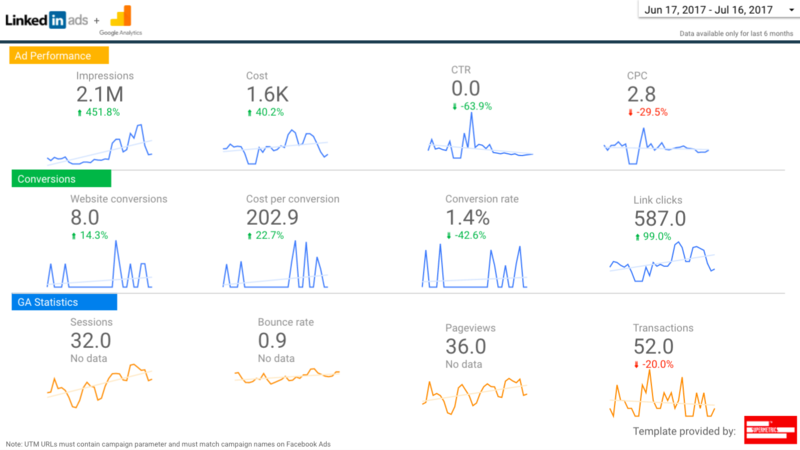 And for such a powerful platform you need a powerful reporting tool;) Supermetrics has released LinkedIn Ads and LinkedIn Pages connectors for Google Sheets and Google Data Studio. 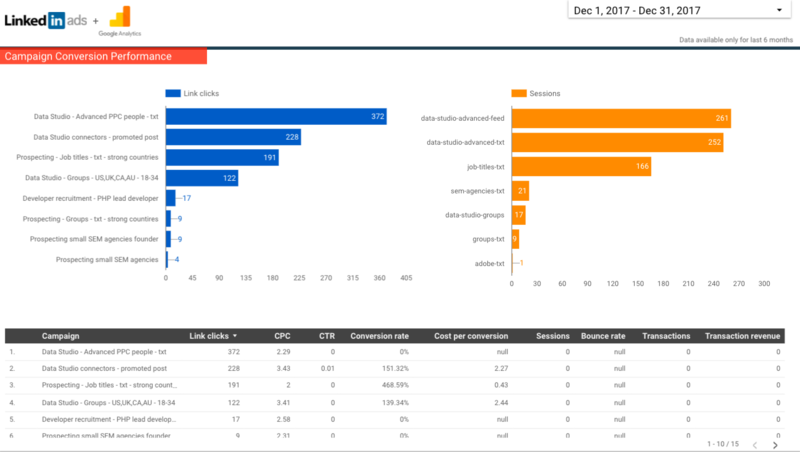 Also, you can use the new Supermetrics’ Ad Data + Google Analytics connector for Data Studio to combine LinkedIn and GA data in one table or chart. With those connectors you can easily report both paid and organic traffic from LinkedIn. But why are Supermetrics connectors useful for LinkedIn reporting? And what are the elements that are missing from the LinkedIn Ads UI so that you should consider using Supermetrics to get more insights? 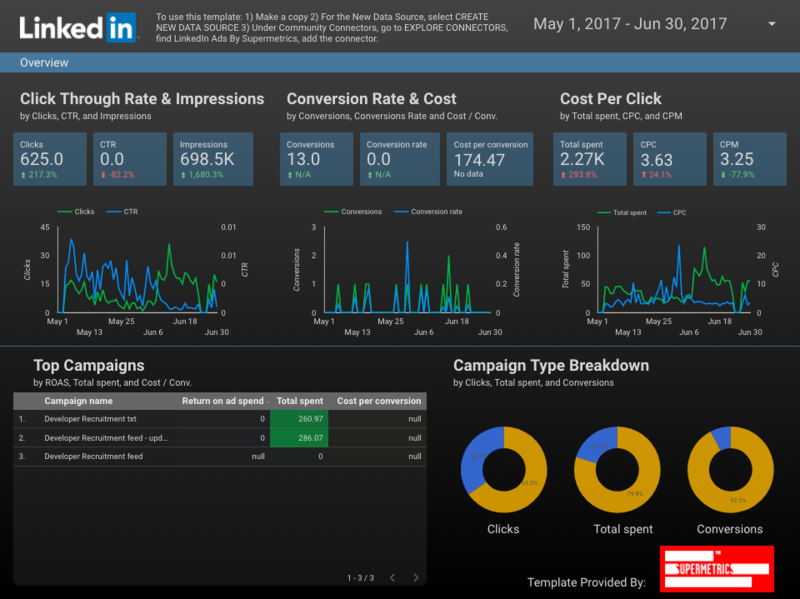 This article tackles those questions, tells everything you need to know about LinkedIn Ads’ interface and introduces 2 free and easy-to-use Google Data Studio reporting templates, which will provide all you need for effective LinkedIn data analysis. Here are the links to reporting templates, which work with Supermetrics connectors for Data Studio if you want to get them straight away! LinkedIn reporting is designed to show you how your campaigns are performing on the platform itself as well as how many conversions you get. 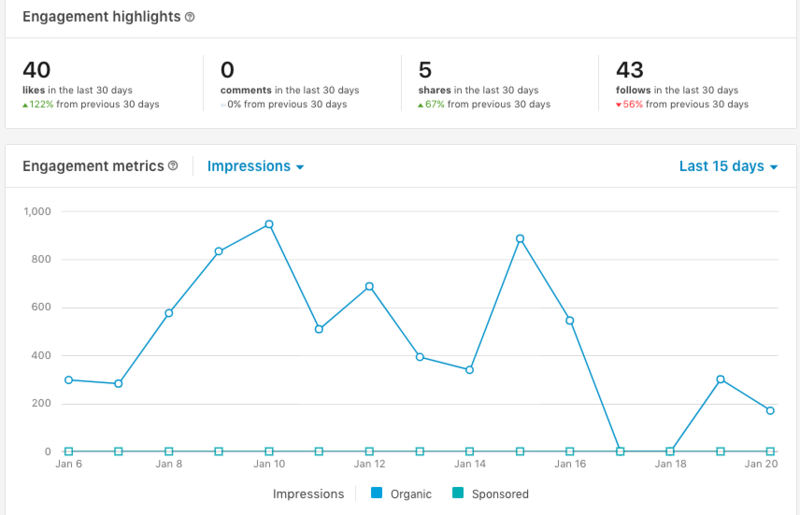 You can see metrics like impressions, link clicks, social engagements and total spend. If you are capturing leads via LinkedIn Lead Gen Forms, then you can also view lead conversion data in your Campaign Manager. Sponsored Content: These mimic the look and feel of organic posts, and show up in users’ news feeds. Sponsored InMail: Targets users via their LinkedIn mailboxes, i.e. target audiences or specific users. Text Ads: Similar to AdWords text ads, these show up on the side bar of LinkedIn. Dynamic Ads: These allow you to target certain audiences with dynamically-generated custom content. Programmatic Display Ads: LinkedIn now offers users access to their programmatic buying platform, allowing to target audiences with customizable display ads. 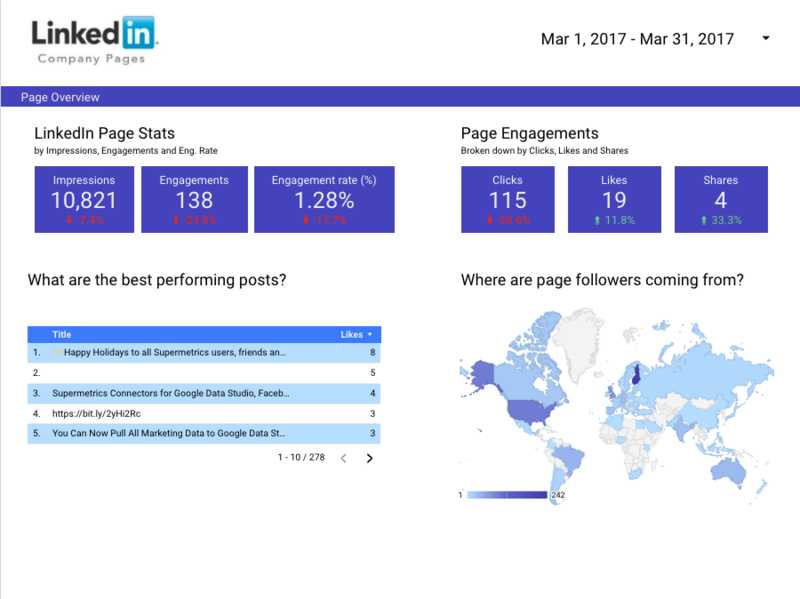 The main LinkedIn dashboard interface will give you an overview of all your campaigns. This data includes the status of the campaign (whether the campaign is running or not), Impressions, Clicks as well as Engagement and Cost metrics. The Total Engagement shows Paid and Social/Organic clicks on your ad. You can dig further into Conversion data if you are tracking Lead conversions on LinkedIn. Access this data by clicking on the Conversions tab, which is located at the top of reporting dashboard. To see social actions, click on that tab, and you’ll pull up a breakdown of likes, comments, shares, follows, other clicks (view all comments, see more description, social count, list of likes, etc.) and total social actions (combination of all social actions). The final tab is the Budget tab. Here you can see the budget breakdown of all your individual campaigns and the number of active ads associated with each campaign. 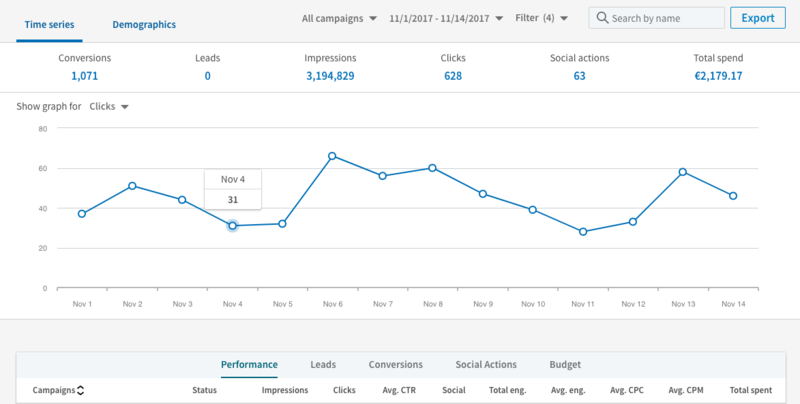 Track individual spend and how individual ads are performing by clicking on the link for the campaign that you want to view. All of this data allows you to determine how well users are responding to your ad. Use it to decide on whether you need to increase your overall budget or create similar changes. The LinkedIn Pages UI analytics is broken down into three sections – Visitors, Updates and Followers. In the visitors tab, you can see the traffic timeline at the top, split by devices. 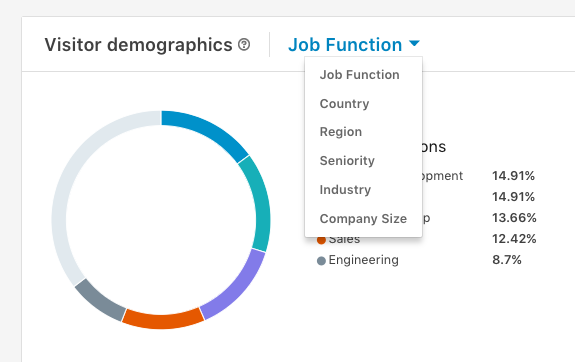 At the bottom of the page there is a pie chart, where the visitor demographics can be broken down by six dimensions: job function, country, region, seniority, industry and company size. The updates tab focuses on the posts’ statistics – engagement metrics’ timeline below a table with key metrics broken down by updates. The last section, followers, focuses on follower statistics of your page. There you can find a trendline which indicates how many followers the page has acquired or lost. Below the trendline there is a breakdown of who is following your page, using 7 demographic dimensions: geography (which includes top 5 countries and top 5 regions), job function, seniority, industry, company size and employment status. Lastly, you can see similar companies and their page statistics. LinkedIn Pages’ interface provides comprehensive analytics on how your page and posts are performing. However, followers, posts and page stats are scattered around on different pages. If you want to get a bird’s-eye view of the performance of your page, you’ll have to jump between pages. Similarly, LinkedIn Ads’ UI does not offer flexible options for reporting and analysis, with only a few chart types and predefined breakdown options. In the native UI of LinkedIn Pages, you can only see data from the past 12 months. To get data older than 12 months, you will have to manually export the reports and store them in a spreadsheet or database to accumulate them on a regular basis, which is boring, time-consuming and error-prone. While you can see how well people are responding to your ad on the platform, you can’t track this all the way through to on-site conversions and interactions. As an example, your LinkedIn Dashboard is showing that you received 100 clicks on your ad. So, you clearly know that there’s interest, the ads are reaching the right audience and that the creative is effective. Bounce Rate: Are people getting to the site or landing page, and immediately leaving? This could mean that there’s a disconnect between your content and the ad messaging, or that your CTA is hard to find. User Flow: Where are people going after they come to your site? What are they doing? How many pages are they visiting? What content interests them the most? On-site Conversions: Most marketers want to know whether people are converting once they get to the site. Are people getting to the conversion or purchase page, and not taking an action? If there are multiple conversion options, what type of ad is driving what type of conversions? Which ad is the most effective at converting? How long is the conversion process? Is LinkedIn more of a direct converter or an assisted converter? Statistics from other social networks: If you are running campaigns in Facebook, Twitter and LinkedIn at the same time you need to see and compare the results across different social networks. You can obtain all this data from Google Analytics, Facebook Ads and Twitter Ads. If you are planning on tracking it this way, set up individual tracking codes in Google Analytics for each creative to help determine individual ad or campaign effectiveness. The problem with this, however, is that now you must go to several different platforms to tell the whole story. You can’t simply see the big picture from only LinkedIn or only Google Analytics. You need both. So, how do you combine this data to avoid having to flip among several different platforms, and more than likely, manually create reports? This is where third-party tools such as Google Data Studio and Google sheets can come in really handy. 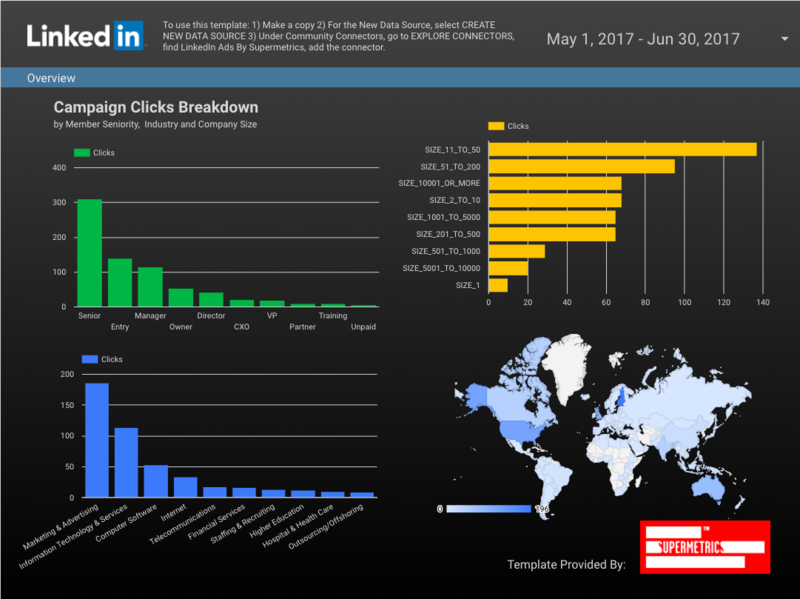 To assist you with reporting LinkedIn data, we have created LinkedIn Ads and LinkedIn Pages connectors for Google Sheets and Google Data Studio. With these tools, you can easily overcome the above mentioned limitations of Linkedin reporting. And now let’s take a closer look at these advantages and 3 easy-to-use reporting templates which will help you discover the full potential of those benefits. 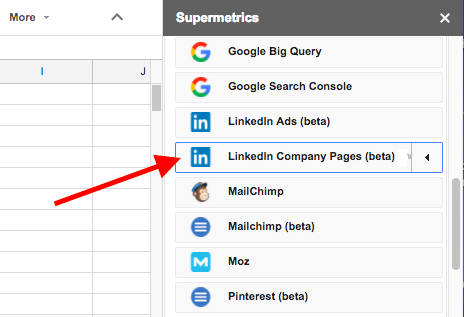 You can easily keep all LinkedIn Pages historical data in your Google Sheets with Supermetrics LinkedIn Pages connector. 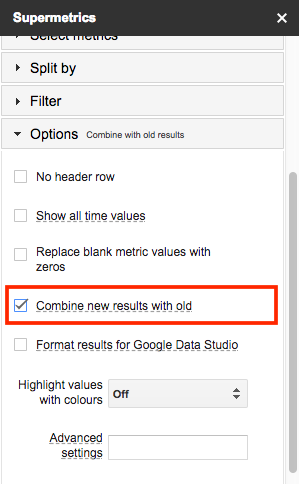 To do so, tick “Combine new results with old” in the “Options” tab while building a query that pulls LinkedIn data. Please note that if it is the first time you are using Supermetrics for Google Sheets, you will not get historical results from LinkedIn Pages, which are older than 12 months immediately – you can only accumulate them by continuously pulling new data. Data Studio is a free reporting tool from Google that converts your data into easily digestible dashboards and reports. You can convert data into shareable tables and charts, which are perfect for presenting to stakeholders and clients. This 3-page template allows you to see the impact all of your LinkedIn Ads campaigns had on your website visits and conversions. Page one of this template gives you an overview of your LinkedIn campaigns’ key metrics, trendlines and performance of your top ads. 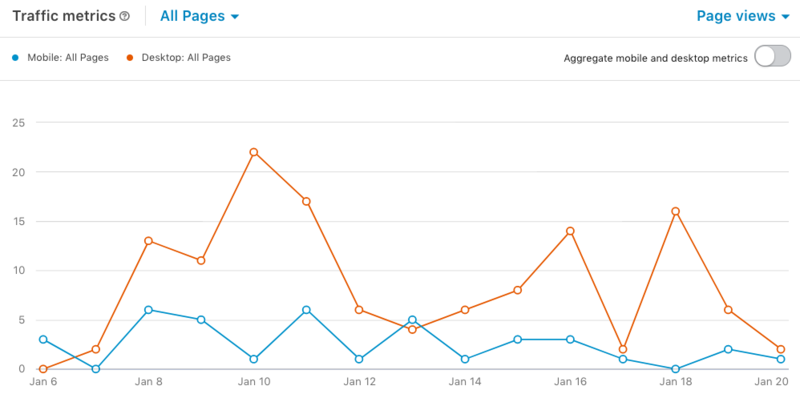 In the line charts, blue shows the data comes from LinkedIn while yellow indicates it’s Google Analytics data. This color code is used throughout the whole template. The second page shows 12 key metrics with a visual trendline for each, to help track the progress of these metrics. The first two rows are LinkedIn metrics with Google Analytics data at the bottom. On the last page of this template you can see top campaigns broken down by link clicks and the number of sessions. The table in the bottom contains combined data from LinkedIn Ads and Google Analytics. It covers the entire customer journey, from the point the user sees an ad, clicks on it and lands on your page, to conversion. Having data from LinkedIn Ads and Google Analytics in a single chart eliminates the need of switching between platforms. This template focuses on our most relevant GA metrics, sessions, bounce rate, transactions and transaction revenue. Additionally you can create your own calculated metrics in Data Studio such as ROAS. 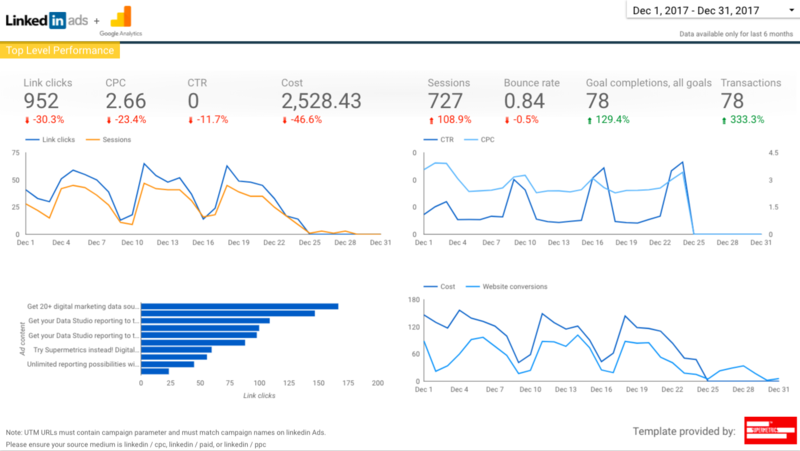 To use this template, firstly, add Supermetrics Ad Data + Google Analytics connector from the Data Studio connector gallery. After copying this template file, add it as a data source, and the file will be populated with data automatically. This connector is great for combining data from social networks and Google Analytics into one chart or table or comparing key metrics from social networks. However, if you want a more in-depth analysis of what is going inside your LinkedIn Ads, it is best to use our LinkedIn Ads connector. This 2-page template focuses on providing an insightful overview of the LinkedIn Ads’ key metrics and audience demographics. The first page shows you the most important metrics and their trandliness, breakdown by top campaigns and campaign type. Next you will see campaign clicks breakdown by demographic. The charts show the distribution of your paid traffic visitors’ positions, industries, countries and the sizes of their companies. This information can also be used for your LinkedIn Ads targeting. LinkedIn is an extremely effective advertising platform, however, it’s reporting UI lacks some basic features. You can’t drill down into overall performance of ads. You can’t see how people are moving through your site, and you can’t determine if LinkedIn is driving on-site conversions from the interface. Adding a third-party tool to assist you with this process can help you overcome many limitations of the LinkedIn reporting UI. Plus, with our Ad Data + Google Analytics connector, you will be easily able to combine multiple data sources to see the entire user flow. Don’t have Supermerics yet? 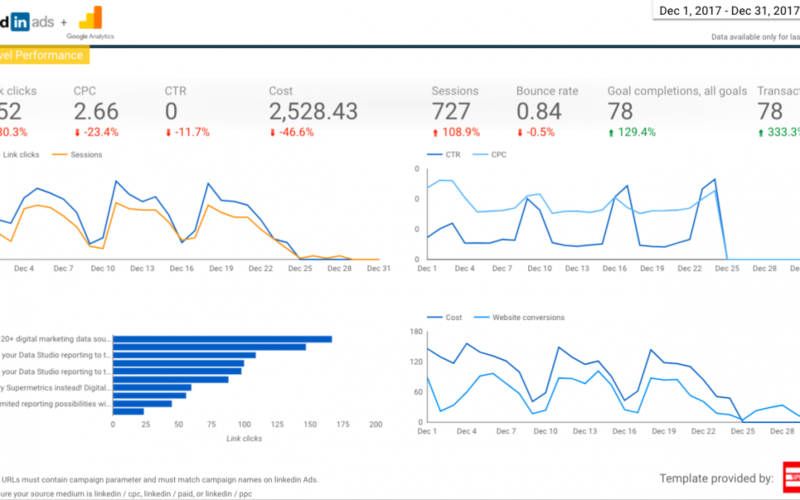 Start full feature FREE trials of our Google Sheets add-on or Google Data Studio connectors today, to better report and analyze your LinkedIn campaigns!